Anne Strawberry: TWD- Linzer Sables and a Giveaway! So pretty, and macadamia nuts and chocolate sound oh so yummy. YOur soup below, wow, it looks just delicious in the green bowl with all the toppings. 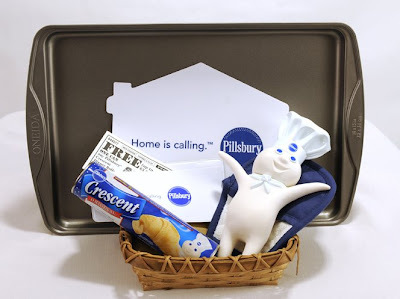 That's a fun give away and so good of Pillsbury to donate too. I'll head over and check out their website. Even if you had a bad day...you have to say something positive...Like.. " The best part of the day was waking up in a warm bed", etc. 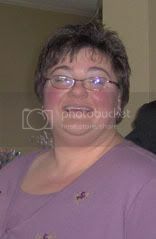 Those cookies look amazing Anne! I'm not really a chocolate lover either... does your husband have an allergy? I'm always jealous when other people can make such beautiful cookies for the holidays. I generally stick to drop cookies for ease. Favorite part of the meal? That moment when my husband and I sit down to the table, he glances at me and sighs, then takes a bite. It seems to be the only calm moment of the day sometimes. I almost used my star cookie cutter, but didn't. Way festive! Yum to these cookies! And your pie looks great. I couldn't get mine to bake all the way, or didn't wait long enough after it'd gone 30 minutes longer than the recipe said and I needed the oven. Oh well. Well, I do love all the family stuff involved with family meals, but seriously, with four boys, my favorite part is when I actually get to eat my food hot or at least warm! Your cookies look great! I think my favorite part of a family meal is when everybody is done just sitting around the table talking...trying to decide who will be the first to get up and start cleaning! Your pie is so pretty! And the cookies really are so delicate looking. I'll bet the chocolate tastes great too! I think what I like best about the holidays is when the dinner is over and everyone is just sitting around talking and enjoying a cup of coffee and a piece of pie! Your husband doesn't eat chocolate? That's ok, I'll just eat his share. I wish that I had rolled mine thinner. My favorite part of a family meal is the actual sitting together and eating. The conversation around a dinner table is just perfection. I like the idea of having fruit and chocolate in the center - wonderful! And your twofer looks like it turned out just right, even if you don't think it was quite perfect. Oh darn, more pie baking (and eating!) :) Oh, and my favorite part of family meals has always been getting everyone in the kitchen to help prep ingredients and cook. It's why I love to bake and cook. 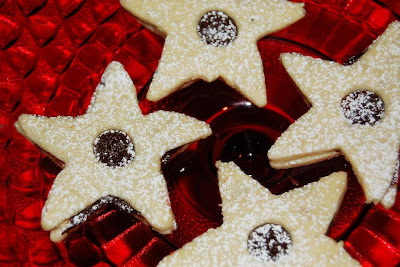 Your stars are gorgeous, Anne, and I adore your idea of putting both jam and ganache in the cookies! Now that might just be my perfect cookie. As far as family meals go, my kids are still little enough that just getting them to sit still for a few minutes can be a feat. But I love the nights when we all sit down together, even for just a short while, to eat and laugh together. 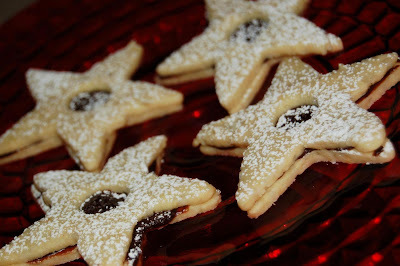 1. the linzer cookies look great, I used a few star cutters myself. And I'm itching to try to the chocolate/raspberry combo now. 2. Yay for pie, yours look great! I love how you can see the two different layers. The stars are very pretty, you were smart to roll them thinner. 1/4 inch is pretty thick, especially if you sandwich them. My favourite part of a family dinner is having everybody there at the same time. I have 3 teens with jobs, lives, etc. Holidays we take our time and sit together and talk during dinner. We make it last for hours. Your stars are so cute! My favorite part about family meals is the laughter. If two people are mad at each other, they aren't allowed to bring it to the table so we never have bad feelings while eating. My favotie part of the family meal is the conversation during the meal. With two little ones it is pretty hilarious! Love the stars! And I can't wait to see your Christmas carol pie. I'm making mine today. Of course your cookies are beautiful! Love your flavor combinations too! My family always holds hands before each meal and prays. We draw close to each other that way and it is definitely the highlight of the meal for me. Also, when my boys were growing up, I had a little pig figurine that I placed each meal at someone's plate during dinner. It stayed at their plate until they could catch someone else with bad table manners, then it would pass to that person. Whoever ended up with the pig had to do the dishes. My boys still remember the table manner pig. My favorite part of a family meal is planning what to make and working out the recipes with my mom. Those look so delicious! My favorite part of family meals is preparing them in the kitchen and talking while we prepare, whether it's to my husband or our guests, there's just something about gathering in the kitchen. macadamias + choc filling sounds perfect! the cookies are so cute, and your pie looks very tasty too. my favorite part of family meals is the same as yours, talking and laughing after the meal is over! Your cookies look good---I could use one with my coffee....munch! Favorite part of family meals- conversation and laughter! Cute stars! Macadamia nuts and chocolate sound divine. My favorite part of family meals is just enjoying each other. For the every day family meals, it's great to see my boys engaging in conversation at the table. I love that time together. Your cookies and pie both look delicious. It hadn't occurred to me to try the ganache and jam together--great idea! I love the linzer stars. They look perfect. Your twofer pie looks wonderful too. YUM! Oooh - macadamias and chocolate. What a clever combo. I also like the star cutouts. 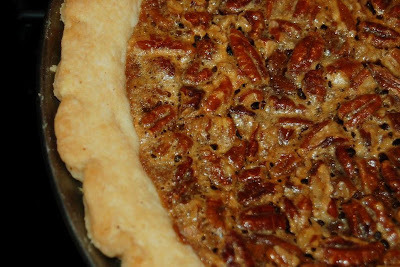 Your Twofer pie has been the prettiest one so far - I didn't make it because, well, no one would eat it. Anyways, my favorite part of dinner is actually eating. And then dessert! So many delicious looking blogs out there and your is definitely one of them! Your Linzers look top shelf. What a fun giveaway! My favorite part is sitting down together and enjoying the meal and talking about everyone's day. 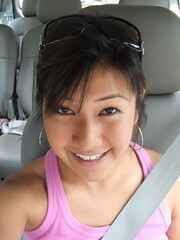 I've been reading for a little while now and LOVE your blog! Thanks for all the great recipes. My favorite part of the family meal is sitting around the table after it is finished and chatting with one another, usually over some beautiful dessert! Your cookies look great and the giveaway would be so nice! My favorite part of family meals is just having everyone together and talking about our day. Beautiful...as for family meals my favorite part would be the conversation! the best part of having dinner together as a family is talking sharing memories with each other of what we are eating. Beautiful little stars! What a cute giveaway idea. My favorite part of family meals is simply the fact that most nights we are all together for a meal. I think that's pretty rare today, and I hope we can keep it up as our daughter gets older (and with one more on the way). I love your take on these, Anne! They sound so good. Oh, I love the stars...I thought about stars, but wasn't sure if the points would get too done, so I chickened out...so happy to see that it works with stars as I will do some of those for Christmas cookie trays...thanks for sharing! Yours look just beautiful...and I am with your husband...bring on the jam ones! LOL. My favorite part is the rushing around that my mom and I do getting everything on the table, then we all take a deep breath and dig in. Extra points if my Dad likes something new that I've made- that's my favorite part! great minds think alike! i did stars too! haha. anyway, my favourite part of a family meal (being from a chinese family) is when everyone reaches out over the table to snare food from a faraway dish. That's the way chinese people do it when the share dishes around the table. Gets pretty rowdy sometimes. haha. I made my cookies into stars also! My favorite part of the meal is watching others enjoy what I have made. I get so much satisfaction from that! What a big post! First - love the macadamia nuts in the linzer cookies. Great idea. Second, I too, like soggy crust, and I won't tell anyone if you won't. Finally, my favorite part of family meal is sitting around and talking. It's a real bonding experience. Both are sooo cute! The cookies are perfectly shaped. Love them. Your star cookies are so pretty. I had my star cookie cutter out but forgot to use it! 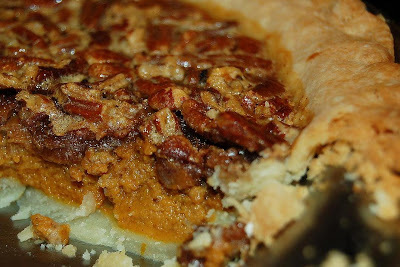 And it's amazing how you can see the layers in your Twofer pie; I could taste them in mine but not see them. Our family dinners are always a ton of laughs. The girls get so silly that we either have to join in or get exasperated. Now that they're gone, we are all together very rarely, but they still act like 8 year olds. My favorite part of daily dinners with my husband is enjoying a glass of wine and fabulous hot bread with olive oil, and talking. Pick Me:) mMmm, your post is making me hungry! I love you shape, they look very pretty. BTW: They are originated in Austria, the town Linz. This town has also a Torte. Beautiful cookies and pie! I really like these cookies. I passed on the pie because we already had four pies for only 12 people. Yours looks delicious! I always enjoyed helping my mom in the kitchen when I was growing up. I look forward to cooking with my own kids when I have them. I still enjoy everyone helping in the kitchen during holiday meals. Two different things light me up at family meals. The first is kind of sad, I get a great deal of satisfaction seeing my son eat what appears to be "normal" food after working my tail off to adapt meals for his allergies. The second is my son's five year old perspective on food and life. Always refreshing! These look so pretty, and I love the addition of the ganache. Wow, two beautiful looking treats in one post --- both turned out fantastic looking. I also loved the cookies, and i must try sandwiching both the ganache and jam! For me, the best part of family meals is the opportunity to set aside the BS and chaos of the day, and focus on a great meal and enjoying the company around the table. My favorite part of family meals is that my little ones are getting old enough to want to join me in the kitchen and help out. It's fun teaching them how to cook. My favorite part of family dinner is the sense of togetherness it brings and the fun conversations. I enjoy your blog! Thank you for your time. I would love to be entered in the drawing! Thanks! My favorite part of the family meal was the moment when everyone is full, we all sit back, and sigh. That moment, so full of content, is priceless to me. The star cookies are lovely. There is nothing like cookies for the holidays. My fav is always just having all of us there. That doesn't happen very often nowadays and it really is something I miss not being able to have more of. My favorite part of "fam-i-lee din-dins" (as we call them) is the conversation. We linger at the table for a long time after dinner, and enjoy each other's company. I'm so glad we never keep a TV running. I love stars. I will have to try to make these! hey...I used macadamia nuts too! Your cookies looks way better than mine, though. oh my gosh! Why have I not thought of this before! My two favorite pies, in ONE PIE. Good grief! I need to make this right now.